Kerry thinks the Democrats are in trouble because the voter isn’t smart enough to understand what the The Democrats are trying to do to for them. The statement does demonstrate just how poorly Democrats and Kerry understand the the mood of the people and the Tea Party movement. The issues that the Republicans and the Tea Party folks have focused on are clear, and well understood. Its Kerry his fellow members of the ruling class that don’t have an understanding of the middle class and middle America. Budgets and spending are a symptom, of the unrest and anger aimed at our Democratic Controlled government. The real issue is that the elitist ruling class doesn’t understand us, and will not listen. The voters are clearly against massive government takeovers and bailouts of our economy industry and Healthcare, while Kerry his Democratic friends told us to shut up and enjoy what they are doing to us. Kind of like Clayton Williams’ remark “Just lay back and enjoy it.” remark that killed his political career. Go ahead John, you can say it .. just once .. Please !! 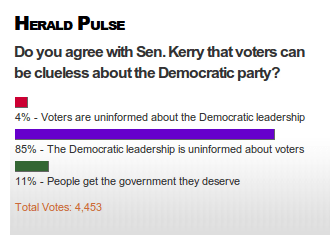 The Boston Herald Poll on the the originating article shows some interesting insight. Who is out of Touch?. Previous PostA Pet PeeveNext PostDiscovery Moves Down to the Launchpad. A co-opted press combined with a radical leftist leadership can only lead to disaster!Mr. Kerry is correct in one sense. The electorate doesn’t pay attention until it’s to late! Once they do, the establishment starts talking down to them as Mr. Kerry and others always do. We are the caretakers of this government, not the morons in office. Educate yourselves on the issues and the folks running for and already in office. Don’t act on their lies and promises. Make your decisions based on their words and actions. Ask the important questions! Love your country! Remember the ideals and principles this country was founded on. Remember those who have paid the ultimate to give this to us. I’ve said before the truth will win out if presented to the people and if the people are in fact paying attention! Of course, that would also mean all the people out there with their hands out would have to become responsible citizens, something any Marxist government frowns on. I beseech everyone out there. Please, step back and re-educate yourselves as to our country’s founding ideals! Somehow we have managed to allow these bastards to brainwash the last few generations! It has to stop! Our very existence as a free country depends on it! I mentioned the main thrust of our efforts have to be aimed at our elected officials, and I still believe that. However, it must be everyone’s job to educate themselves as to not only what is going on as to this radical march to the hard left, but also we maybe have to reach back and re-educate ourselves on this country’s basic ideals and principles! What is going on now is a complete betrayal of everything our founding fathers stood for. If we let it continue, shame on us all!